Believe it or not: losing weight is the easy part. Doing so requires that more calories are burned than are consumed, and any number of diets will effectively achieve this aim. Keeping the weight off after the diet is over, on the other hand, is the part that many people find so difficult. Maintaining a healthy body weight after shedding pounds isn't easy, but it's not impossible; it simply requires the cultivation of a few healthy habits and a good dose of commitment. Below, you will find some tips we've gathered to help you keep off that pesky spare tire. You might not have to keep following the strict routine of your initial diet, but that lower number on the scale doesn't necessarily mean eating whatever you want again is fair game. Continuing a regime lower in calories than your pre-weight loss diet is not only healthy, but might even be necessary to keep your weight down. Low-calorie diets and weight loss are great but are also associated with lower metabolism, which means two things: continued weight loss is harder, and gaining weight is easier when old habits are resumed. There has been a link between obesity and people who skip breakfast. Furthermore, people who eat breakfast consistently are shown to keep off weight more effectively. Doing so will keep you full and energetic throughout the day, and help you avoid getting too hungry and overeating later. 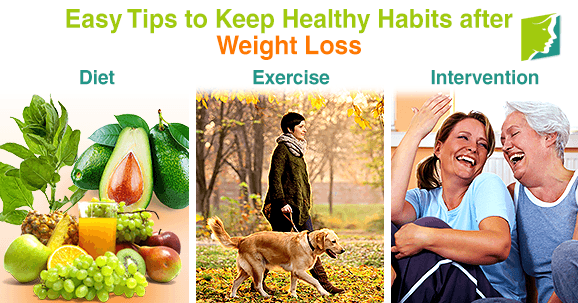 It's important to keep participating in daily physical activities after losing those pounds. People who have successfully maintained their weight loss usually engage in 60 - 90 minutes of moderate exercise each day. This could be as simple as taking a brisk 20 minute walk three times a day. Planning ahead will go a long way to keep you on track. Oftentimes, weight starts creeping back up when life inevitably gets in the way; anticipate moments when you think you'll need a snack, make time to use the hotel's gym on a business trip, jot down ideas for meals on the vacation coming up. When you plan for life's unavoidable curve balls, you'll be more prepared and less apt to settle for unhealthier choices. It's a good idea to keep track of what you're eating, when you're exercising, and how much you weigh. That way, you will have a clear idea of when and how you need to make adjustments and keep any bad habits from slipping in the back door. If you start to put on a few pounds, you'll be able to get back on track right away. Use your family, friends, and other people in your life as additional support. When you're feeling like you're in a rut or need some encouragement, your loved ones will be right there cheering you on and offering help and suggestions. Basically, maintaining your health after weight loss boils down to consistent, positive choices - a whole new style of life, in fact. Staying the healthiest you isn't a one-time deal. It's a mode of operation, a day-in and day-out thought process. The beauty of this kind of commitment is that you will be healthy and fit, which is one giant leap towards being both happy and whole. Read more about losing weight. Keeping it off. (2011). Retrieved on January 29, 2015, from http://www.cdc.gov/healthyweight/losing_weight/keepingitoff.html. I'm Gaining Weight during Menopause: Should I Care? Menopause marks the end of a woman's reproductive life, and is often accompanied by weight gain. Learn more here. Food cravings can be a serious problem when approaching menopause. Read on to learn some ways to handle them. Can Power Yoga Help Me Lose Weight? Yoga is commonly mistaken as just a mental workout that doesn't provide a physical challenge. Read on however, to learn about the physical benefits.